Nafpaktos is a very beautiful city the capital of Nafpaktia region in the Prefecture of Aetoloakarnania, and it is one of the oldest towns in Greece, with a history of more than 3500 years. 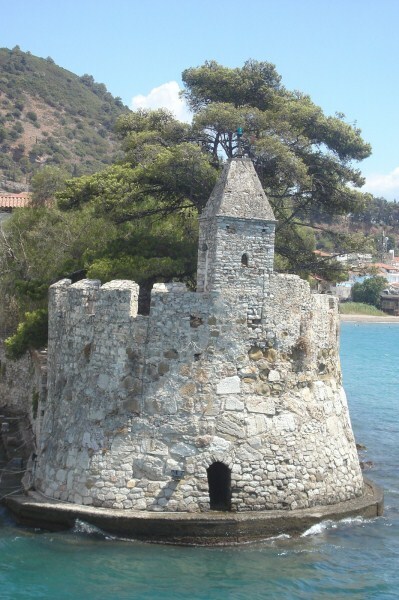 • The well remained castle that dominates the hill with the pinewoods behind the city. • The traditional houses in the centre of the city with their narrow cobbled stoned streets. • Botsari’s family mansion which has been converted into a museum. • The two crystal clear beaches of the city, Psani and Gribovo. • Visit the Holy Abbey of Saint Augustine Ipponos and Saint Serafeim of Sarof. (Trikorfo Doridos outside of Nafpactos). The holy Abbey of Saint Augustine Ipponos and Saint Serafim of Sarof is one of the most beautiful modern monasteries of Greece. It can boast that it allocates the largest belfry in the world. 400 bell chimes and 60 bells transport everywhere the message of Christianity especially to young people that visit the holy Abbey by thousands.